You can certainly download the current v2.3 apk if you like, and it can be installed on devices running versions of Android below O, but it will probably crash on launch, so it is unadvisable. Left: version 2.2. Right: version 2.3. Text messages introduce an interesting challenge for many users. When a new SMS comes in, it's fairly common for the whole content of the message to be visible right in the notification. That's a good thing since it means you probably don't have to switch apps to read the rest of it. However, if you swipe the message away without taking action, it remains in your list in the unread state, which means you'll probably end up doing some housekeeping to manually mark messages read later. 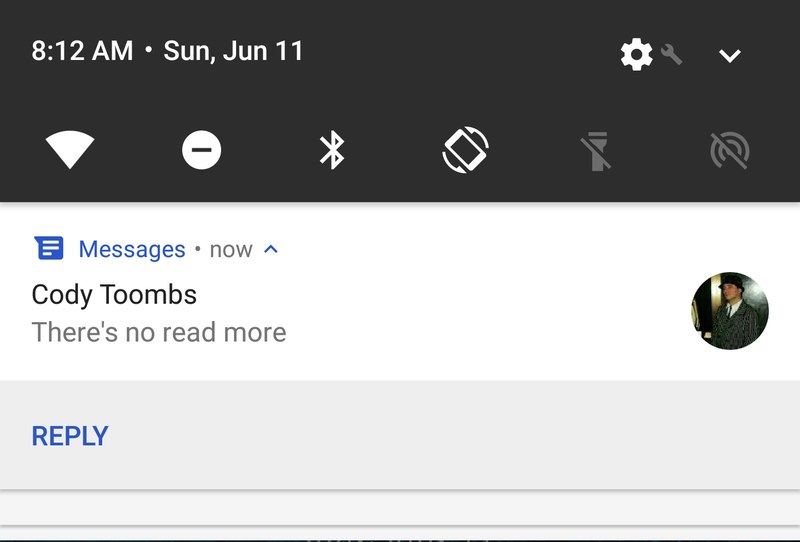 The latest update resolves that with a simple, straight-forward solution: It now has a 'mark as read' button positioned at the bottom of the notification. It works just as you'd expect by marking the message read and dismissing the notification in a single tap. 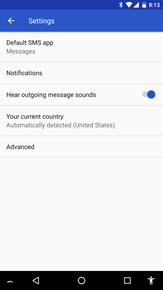 There are other apps that offer the same feature, so it's not original in any meaningful way, but it's nice to have for those of us that stick to Android Messages as the default SMS app. 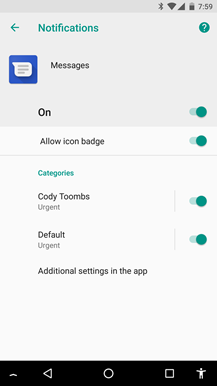 When new versions of Android come out, it's pretty common to see Google's apps adopt some of the new capabilities; but it's really rare to see an app completely trade in some of its existing functionality to be replaces by the OS. 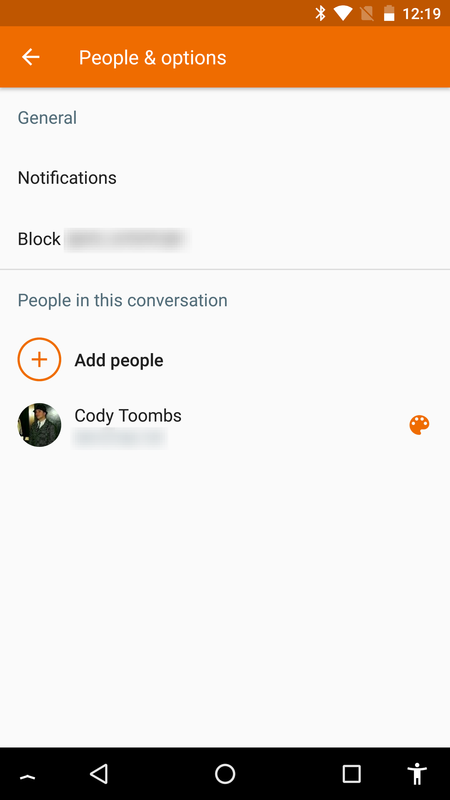 That's exactly what has happened with the latest version of Android Messages. 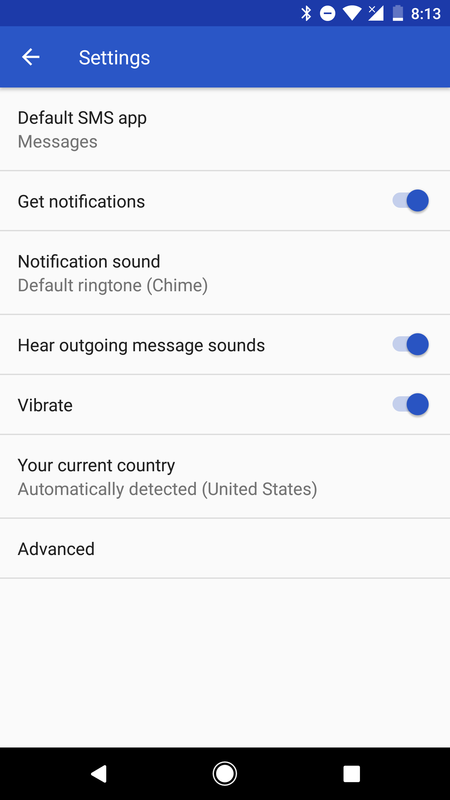 The notification settings for individual users and all general messages have been removed and Android Messages now directs users to Android O's Notification Channels instead. Left: General settings from v2.2 and v2.3. Right: Individual settings from v2.2 and v2.3. This probably sounds a bit strange, but the screenshots make sense of it pretty easily. 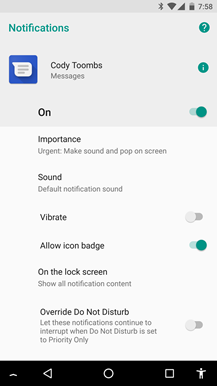 In earlier versions of the app, settings inside the app were used to configure if you got notifications, if they vibrated, and what sound was made. 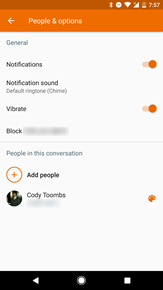 Settings were possible for the app as a whole, but individual contacts could also be configured differently. Those options have been replaced by a single line named Notifications which leads to dynamically added notification channels in the system settings. 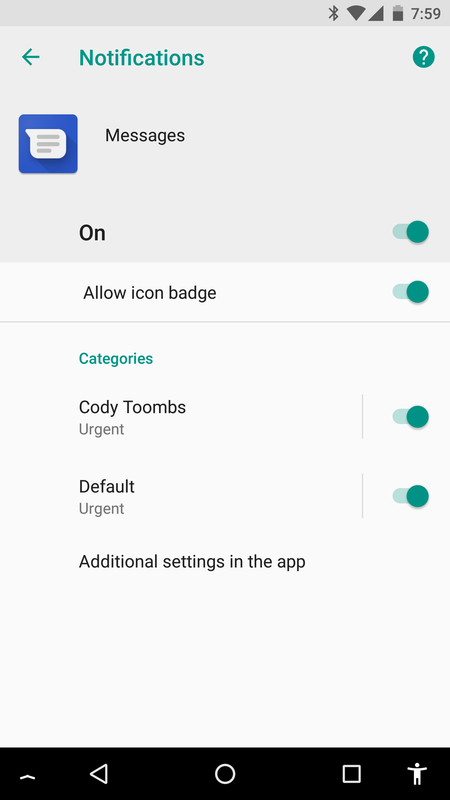 Version 2.3 uses notification channels instead of in-app settings. 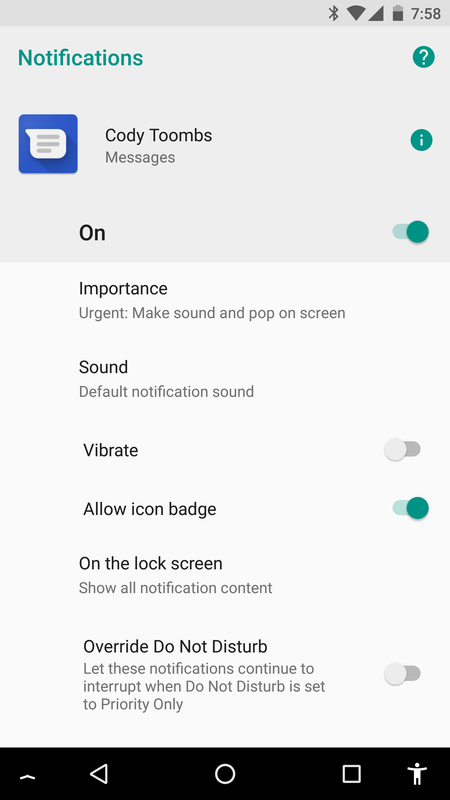 With Android O, the notification channels are now used exclusively to control notifications. 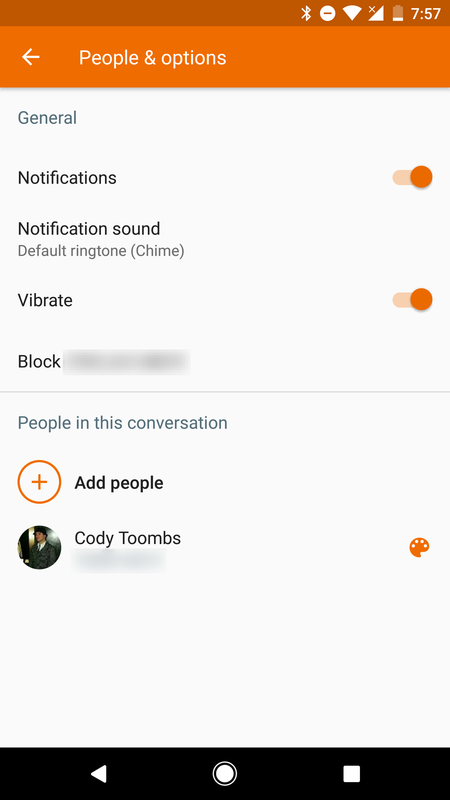 There is a Default channel for all incoming messages and dynamically added channels for any individual contact you choose to configure separately. The biggest advantage to this method is that there's zero redundancy. 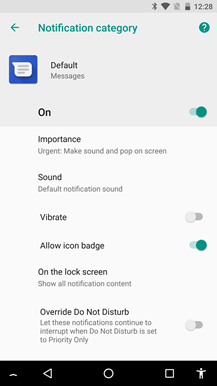 Many apps will continue to offer custom settings for notifications, but they will be largely duplicated by the functionality of Notification Channels. 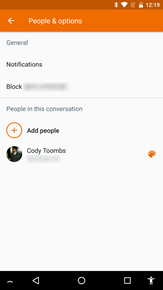 On the other hand, Messages still has to offer the traditional interface for older versions of Android, but it's a great inspiration for apps that may be able to do the same. 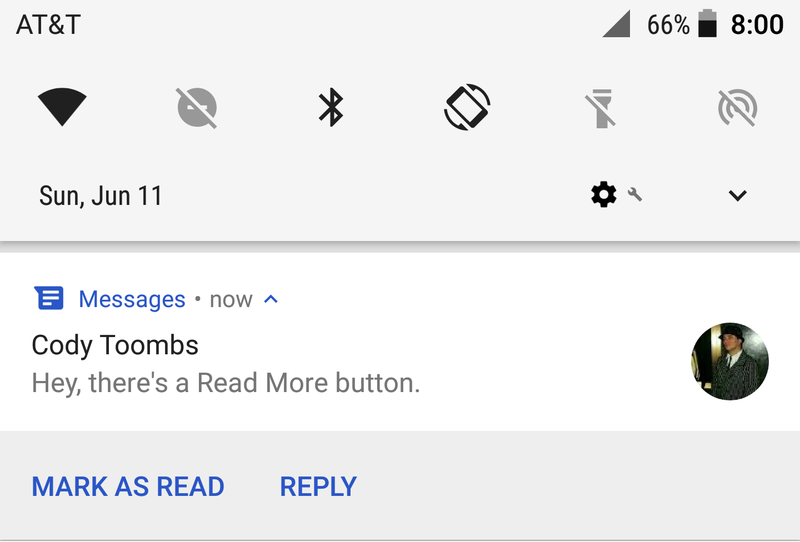 There's also a bonus advantage in that future versions of Android may add more features to notification channels, and Android Messages will get those instantly and without doing any work. Note: I updated to Developer Preview 3 without checking this app for this scenario, so it may be possible that it was added in Developer Preview 2 and it went unnoticed. Even if it's not brand new, it seems this hasn't been covered elsewhere, so it's worth talking about it now. Trading text messages often happens when one or both parties are on the go, so it's not always easy to put together a well-formed message while you're jogging through a crowd or trying to drive a car (not that you should be texting and driving). One of the great innovations to speed up messaging came in the form of suggested replies, something a few apps have adopted in recent years. 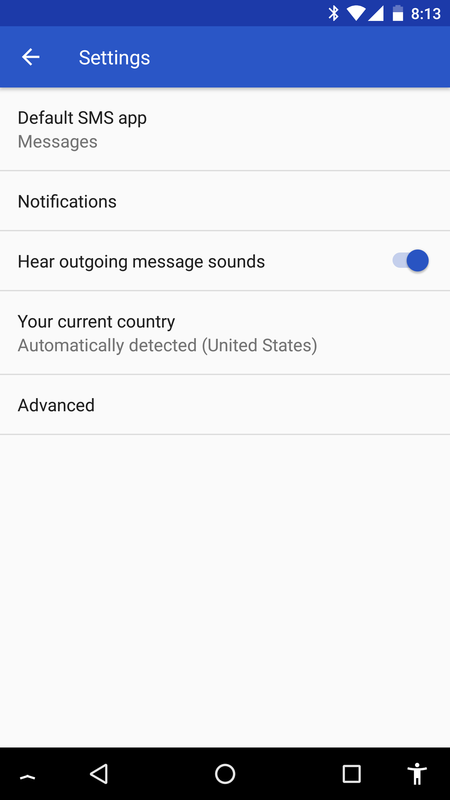 It seems Android Messages will be adding them, as well as offering to open a few types of apps. The latest apk includes new text with a series of actions that can be suggested to users based on the context of a message. At this time, the fairly traditional reply appears to be supported, which I suspect will resemble Inbox's Smart Reply feature. It can also suggest sharing a location if you're asked for your whereabouts. From here, the suggestions are oriented toward things you might want to do for yourself based on incoming messages, including: opening a calendar, maps, your phone app, or even a web browser. In my attempts to activate these, none of them seem to work yet. 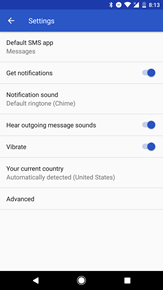 I expect the natural language processing of incoming messages might require help from Google's servers, and that means there are privacy implications and surely an options to turn off such processing, neither of which are visible in the app at this time. For that reason, I'm pretty sure this isn't ready to be triggered remotely, so there will probably be more work to do before a launch is possible.